This modern apartment of 60m2 is available in the neighborhood of Eixample. The living room is furnished with a sofa (which can be converted in a double bed), a beautiful coffee table, two armchairs, a television and some decorations which make the apartment even more welcoming. It also contains a living room area with a table and four chairs to enjoy the good meals that you will cook thanks to the equipped kitchen, open on the living room. The apartment also includes two beautiful bedrooms, the main room is furnished with a large double bed and the other one with two simple beds.The bathroom is spacious and contains a bathtub, perfect to enjoy you holidays and relax yourself. Located in the Eixample neighborhood, the apartment is only a few minutes from some attractive places of the city such as the Plaça Catalunya, the Arc de Triomf and the Passeig de Gracia where you will find the best shops. 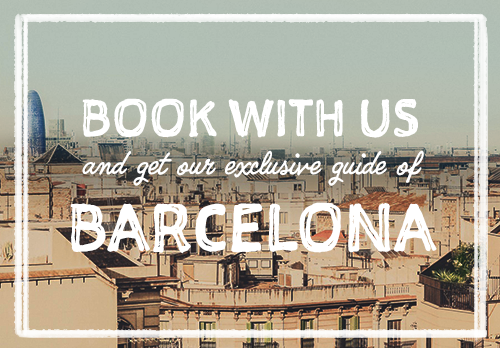 You will be close to a lot of restaurants and bars, to enjoy as much as possible your stay in Barcelona. There is different metro station close by, Urquinaona (L1/L4), Passeig de Gracia (L2/L3) and Universitat (L2) which will enable you to rapidly join the rest of the city. The apartment is pretty and super close to the center. We loved it! Apartamentul in sine frumos, nici mic nici mare. Se afla in centru si are cateva statii de metrou la cateva strazi departare. Bucataria ne-a parut putin mica. Мы сначала хотели снять другую квартиру, но владелец отказался там или не ответил, не знаю. Фирма написала нам письмо с извинениями и предложила эту квартиру. Нам оставалось пару дней до приезда, мы решили, что и эта подойдёт. В конце концов остались довольны. Квартира в центре, 3 остановки метро по близости с разными линиями метро, так что добраться куда-то не было проблемой. 5 People are watching this accommodation.